AMPLE 8QT CAPACITY: With an ample 8 qt. capacity, this chafer is ideal for serving a variety of appetizers, entrees, or side dishes. Its universal size also ensures it can accommodate the included food pan, water pan, and chafing dish cover, as well as any other full size universal equivalents. Use your own fractional pans in place of the included full size food pan for a customized set up, too. DURABLE STAINLESS STEEL: A durable stainless steel construction ensures this chafer is built to withstand everyday use, while providing a timeless appearance that blends in with your classic decor. 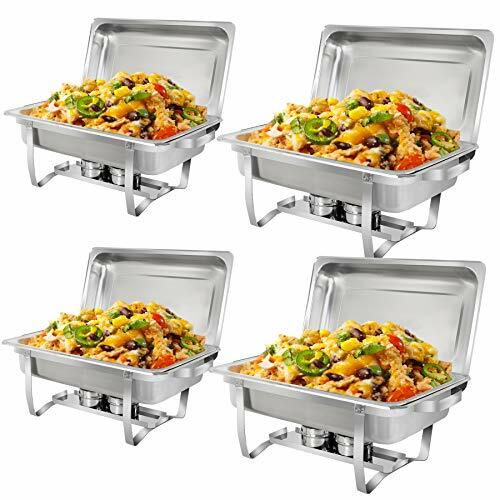 It is designed to hold the lid in an upright position while food in the full-size chafer pan is being served. Also the beveled legs provided optimum stability. MIRROR FINISH: To draw your guests in, a mirror finish on the lid and body of this chafer beautifully picks up on, and reflects out, your venue's ambient lighting for a glamorous presentation. NEVER rust, tarnish or corrode. With rounded corners within the food pan, this chafer ensures easy cleaning while minimizing food waste. SAVE SPACE & LOW MAINTENANCE: Stack-able design ensures easy transportation. It allows you to save up to 50% space. A defined lip on the included water pan protects tabletops from messes, ensuring an effective barrier against minimal spillage. FULL SET: Comes with everything you need: water pan, food pan, lid, frame and two fuel burners. Compared to other fuel burners on the market - Our fuel burners ensure your culinary creations maintain temperature with even, consistent heat distribution. Easy to light, odorless, and burns clean. It delivers high-quality heat that burns hotter, longer, and safer than comparable fuels. ideal for Buffets,Catering, Parties, Wedding Banquets ..etc.